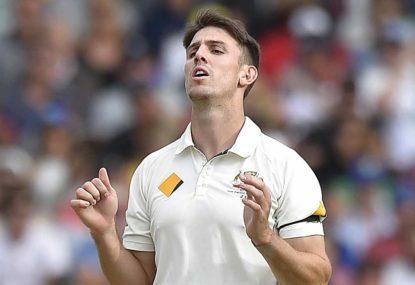 Following Australia’s victory in Adelaide, the selectors have added all-rounder Mitchell Marsh to Test squad for the third Test, who will likely come in for the struggling Peter Handscomb. The selectors have indicated that the reason for Marsh’s inclusion is to give the Test side a fifth bowling option. The problem with Marsh’s previous appearances in the Test side have been the fact that he significantly reduced the side’s batting line-up in order add a mediocre fifth bowling option. While the need for a fifth bowling option is certainly understandable, it shouldn’t result in weakening the batting. All a fifth bowler needs to do is bowl 5-10 overs a day in order to make sure the remainder of the bowling line up, in particular the fast bowlers, can be properly rested. Glenn Maxwell is Australia’s most in-form batsman outside of the Test team. He is the Sheffield Shield’s leading run scorer scoring 590 runs at an average of 73.75 at the halfway point of the Shield season. While Maxwell’s bowling isn’t at the same standard as an Andrew Flintoff or a Ben Stokes, he is more than capable of bowling 5-10 overs a day to ensure the other bowlers are properly rested. Crucially, picking Maxwell won’t weaken the batting line-up. While he has had some good form recently, Mitch Marsh needs a full season of Sheffield Shield before being considered for Test selection. If Peter Handscomb is to be dropped for the Perth Test, Glenn Maxwell should be the man to come in.